Drunkabilly Records & Mailorder - LINK PROTRUDI AND THE JAYMEN : SLOW GRIND! 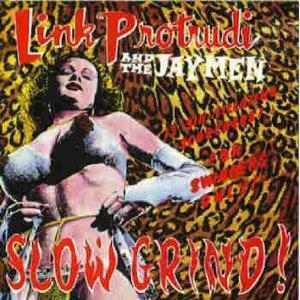 LINK PROTRUDI AND THE JAYMEN : SLOW GRIND! 2 nd solo project from Link Protrudi, singer/guitarist + songwriter of Fuzztones. Based on late 50's instrumental surf and Rockabilly Psychosis. Discription on the CD says: MEN! Want her to Turn On ? Want her to GO GO GO??? With a little help from LINK PROTRUDI & THE JAYMEN, she'll be hot To Trot to your tune! No matter what you want to play, be prepared for fast-action results ! Slip slow grind on the hi-fi, sit back and relax as she peels away her clothes (and inhibitions! This is the real thing ! Even better than the SPANISH FLY! Safe and simple to use. Long lasting results.